With the Lions once again having their eyes on getting a home playoff game after a win against Edmonton, we look back at some of the keys for that win. 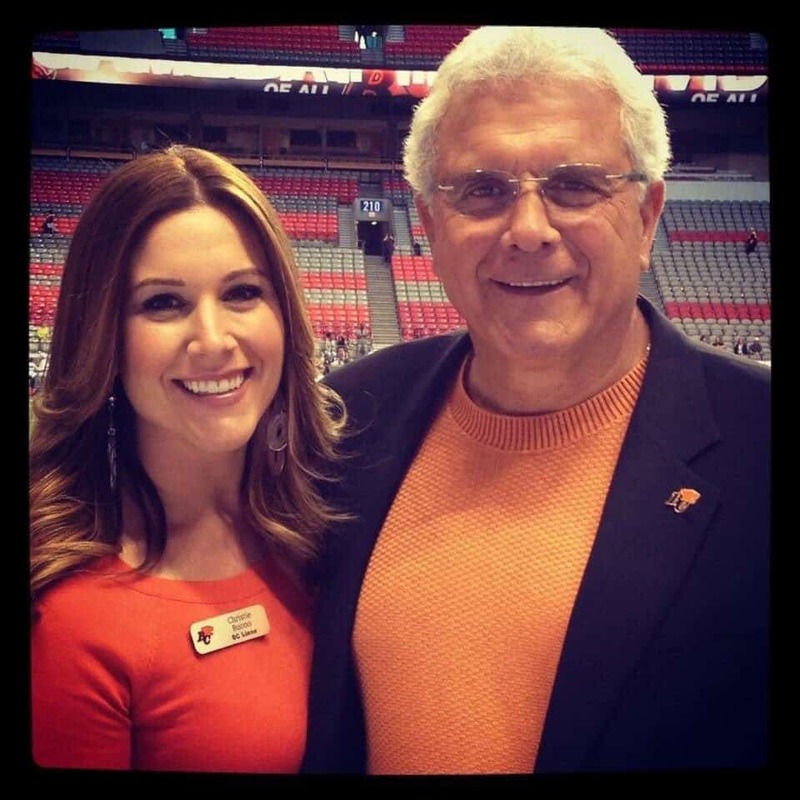 Christie Buono, daughter of the CFL’s all-time winningest coach stops by to talk about growing up in a football family. Piffles Podcast host Steve Safinuk joins the show to talk about the Riders and the final game at Mosaic Stadium. This show was recorded on October 26th, 2016. 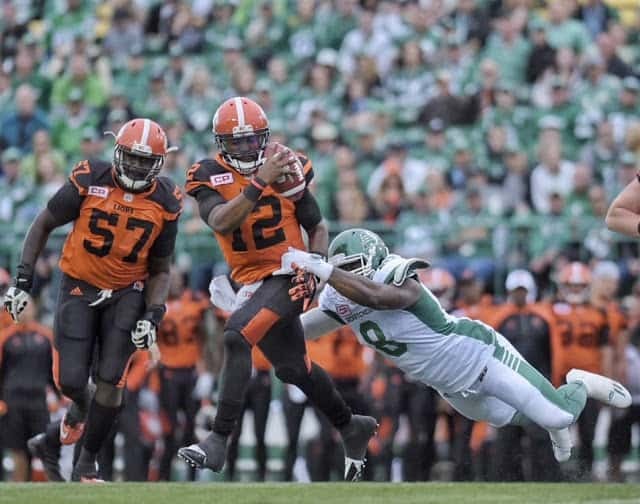 The BC Lions opened their preseason in Regina on Saturday night in a game that saw a delay of over an hour thanks to an outage that knocked out power to most of the city. It wasn’t a masterpiece, but the Lions showed some promising signs in a typical preseason game that saw penalties and mistakes dominate the play. The Lions came away with a 28-16 victory over the Saskatchewan Roughriders and we take a look at a few things that stood out for us. Keith Price tries to evade pressure. In limited action, Jonathon Jennings picked up where he left off last season showing the ability to escape pressure and deliver laser beams to his receivers. Jennings connected with Manny Arceneaux for 46 yards before firing a dart to Shawn Gore for a touchdown. Jennings has outstanding timing on seam routes and delivers the ball where it needs to be quickly. Travis Lulay started slowly, mainly due to some drops by receivers in bad field position. But Lulay settled in and had some good success as well. His best effort coming on a called back touchdown pass to Bryan Burnham. Even though the score didn’t count, the ball was thrown brilliantly and displayed that Lulay is feeling just fine and able to make throws he may have missed in the last couple of years. Keith Price started the game for the Lions, and didn’t do much to separate himself from Greg McGhee who got mop up time in the fourth quarter and will likely get a chance to state his case in the home preseason game. Richie Leone showed the work he’s done in the off-season has paid off. His punting continues to be excellent, but Lions fans were anxious to see his place kicking. Leone showed well going 4-4 on field goals with a long of 48 yards. He also punted a 65-yard single while averaging 42.7 yards per punt. Jeremiah Johnson got the bulk of the work in this one, compiling 45 yards on 7 carries. His longest play from scrimmage was 21 yards. Johnson also dropped a check down pass from Lulay that stalled a drive. He also fumbled (recovered it) but did punch the ball in on a 2-point convert attempt. In my opinion left the door open for Anthony Allen to make his case next week versus the Stampeders. Newcomer JC Coleman only saw action late in the fourth quarter but showed explosiveness and speed with his 7 carries for 32 yards. Regardless of what the Lions do with Allen and Johnson, I hope they can find a way to keep Coleman. Shaq Murray-Lawrence could be in tough. He only had 1 carry for -3 yards and doesn’t seem to have the same shiftiness that Coleman possesses. This could be the best unit on this year’s team when all is said and done. The Lions have stockpiled some options here and the likes of Ronnie Yell (pick 6) and TJ Lee (INT) looked to be in mid-season form. Newcomer Anthony Thompson also had a nice game with a special team’s tackle and an interception. Mike Edem had four tackles for the Lions, while Keynan Parker will wish he had done better on a late Rider touchdown where he ended up behind the receiver and the ball and allowed the score. Once the starters came in I thought the protection was pretty good for the QB’s. They were forced to scramble at times but there were no glaring protection errors. Jovan Olafiyoe still looks like an all-star at left tackle and the young guys all had decent games. There is definite room for improvement, especially with run blocking, but there were several occasions where the line gave enough time to the QB to at least find a check down option late in the play, when nothing was open downfield. Chris Rainey still looks dangerous as a returner and despite not breaking a big one, there were a couple returns where you thought he might. Coverage on punts and kickoffs was solid, with Davarus Shores picking two special teams tackles, one of the spectacular shoestring variety. Ok, everyone can take a deep breath and relax. The general consensus on social media was that people either loved or hated the Lions new look, there really was no in between. Most of the comments were about the orange helmets and the white logo, something I had concerns about when the uniforms were released back in May. If you haven’t already read, the Lions were wearing road helmets with their home uniforms. The club stated they wanted to save the blacks for a home crowd debut, so keep that in mind when commenting in the combination they wore in Regina. That said the helmets appear to be a different shade of orange than the home jersey, so let’s hope when they are paired with the road jersey, that isn’t the case. Still, it’s confusing to me why a team would have two different shades of orange as a primary colour, if that is indeed the case. Sometimes things look different on television than they do live. That said, I think some fans who didn’t like the look on Saturday will be relieved when they see the proper black helmet on those home jerseys because I have seen them in person and they are outstanding. It was great to see Wally Buono back on the sidelines again and he looked very comfortable during the game. Even joking around with the players a bit at times. Something seems different about Buono this time around, and I think this team is going to love playing for him. This could turn out to be Buono’s biggest accomplishment of his career if he can turn this thing around. Buono spoke of wanting to win both pre-season games to establish that culture again in the Lions room. A big part of winning is attitude, and believing you’re going to win every time you step on the field. That was a staple of Buono teams in the past, and they took a step towards that in Regina. Buono won’t be pleased with 17 penalties on the night to the tune of 126 yards. Hopefully they got those out of their system and will be much cleaner next week against the Stampeders. Kudos to Sask Power for getting the power restored relatively quickly last night. That situation had the potential to ruin the chances for some players who might have only gotten this chance to show what they could do. I hope they find the confetti cannon bandits that were responsible and hand them the bill for the repairs. This week on the Pawdcast we’ll be joined by former BC Lions QB and TSN 1040 colour man Giulio Caravatta to get his thoughts on the game and where he thinks the toughest cuts will be when the dust settles on the preseason.